Airtel 3G Data Rates slashed for Prepaid/Postpaid customers! Airtel today announced significant reduction in their 3G data tariffs, much to the delight of Airtel subscribers. As per the press release sent to us Airtel has also launched additional data usage plans “Smartbytes” for postpaid 3G data subscribers. With Smartbytes 3G data plan, Airtel subscribers now have a choice of subscribing to incremental 3G data usage packs. What this means is – even if a subscriber has exhausted its 3G data usage, they will be able to continue enjoying uninterrupted access to 3G browsing on their mobile devices. Even though there is no restriction on the usage. However, as usually is the case subscriber will not be able to carry forward the data and will have to consume the limit within the validity period. Along with Smartbytes, Airtel has also launched “snacking” packs which will allow consumers to pick up a 3G plan for as low as Rs. 10/-. It is interesting to note that Airtel’s smallest 10 rupee pack does not have data limit, but a time limit of only 30 minutes. This will be popular with lot of users who essentially want to do things like checking email or downloading files or checking out a short clip of videos. These data plans bring about a significant rate cut, as much as 70% for volume based browsing – Previously, 3G data tariff cost consumers 10p per 10 kb of data. That has been bought down to 3 paise per 10 kb (Roughly Rs. 3 for 1 mb of 3G data transfer). Like we have mentioned many times earlier – there are 2 main problems due to which 3G has not really taken off. One is higher pricing and second is bad infrastructure. While former is slowly getting addressed, it may be sometime before the Telecom providers are able to offer more optimized infrastructure for increase of 3G penetration in India. 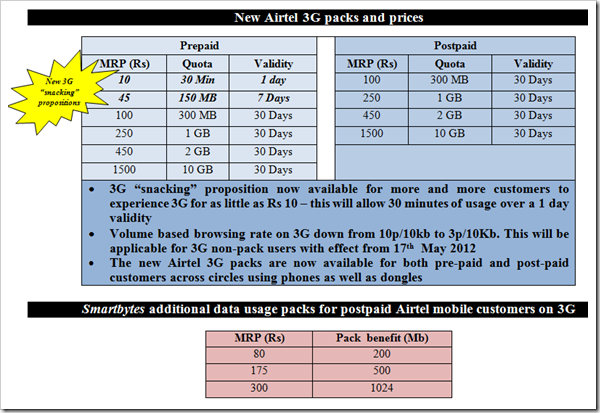 "Airtel 3G Data Rates slashed for Prepaid/Postpaid customers! ", 5 out of 5 based on 1 ratings. Vodafone phone is useless.. the service and internet is pathetic. I am moving to Airtel. speed of 3g in airtel are not bad. I think airtel 3G&2G is the best………. I welcome the rate slashes. I am internet uger airtel plans is best plan. EXCLUSIVE & INNOVATIVE MOBILE SHOPPING APP- GREAT VALUE TO ANDROID AND BLACKBERRY USERS. Hi.. just thought of sharing this wonderful mobile shopping app MintM which rewards me with mint points for just visiting the shop while shopping and redeem them with variety of items in various outlets. Made my day.. Freely available at. Seems all networks going to slash the prices soon. Since yesterday, I am receiving smses from Aircel (Odisha Circle) regarding new 3G packs. Unlimited one month rs 128, unlimited one day rs 7. Haven't used yet, but sounds unbelivable.